WOULD YOU BUY A HOUSE SOMEONE WAS MURDERED IN? Interesting Article – I thought I would share it. Would you buy a house where someone was murdered? 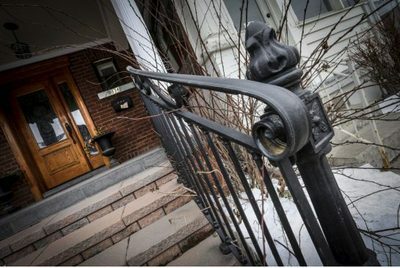 TORONTO — It’s a three-story detached brick house with the kind of old-world luxury that tends to make people ooh and aah: four marble fireplaces imported from Europe, hand-carved crown moldings, a gorgeous oak staircase. Welcome to 934 Ossington Ave. Though the lavish five-bedroom house may well be worth the asking price of $949,000, it has languished on the market despite multiple attempts to sell it over the past 15 months. That’s an eternity in Toronto, where detached homes near the subway often sell within days in frenzied bidding wars. It could be, as the agent who listed the property for sale most recently suggests, a combination of unlucky factors. Or, it could be one big deal-breaker: the fact that a man was murdered in the house two years ago. The crime puts the grand old residence squarely in the category real estate agents call “stigmatized properties,” a blanket term used to describe homes with unfortunate histories that could affect their market potential. Would you buy a house that was once a marijuana grow-op? A meth lab? A crack house? The site of a horrific murder or suicide? Death, in particular, tends to make buyers uncomfortable. Even though some people scoff at superstitious fears — after all, isn’t it possible many of Toronto’s 100-year-old homes have eerie pasts we just don’t know about? — the potential impact on resale value may scare away the folks who otherwise wouldn’t care. Barry Lebow, a veteran real estate appraiser, says stigmatized properties nearly always sell for less than they would have without the stigma. And therein lies the reason some folks go for them: “To get a bit of a deal,” Lebow says. Now that’s an uncomfortable truth to ponder: you can probably get a discount on a house if someone has been murdered in it. The house where Allan Lanteigne was killed in March 2011 sits on a busy stretch of Ossington Ave. a few blocks northwest of Christie Pits Park. Police have released few details since the University of Toronto accounting clerk was found dead, but it is believed he was beaten to death. Lanteigne had been living in the house since 2006, two years after he married Demitry Papasotiriou, a Greece-born Toronto lawyer. Papasotiriou, 33, co-owns the property with his aunt and uncle, who live in Manitoba. At the time of the murder, Lanteigne was living alone at the house. Papasotiriou had moved to Europe. According to friends and police, they were estranged. Last November, more than a year and a half after Lanteigne’s death, police charged Papasotiriou with first-degree murder. Soon after, his business associate, Mladen “Michael” Ivezic, 52, was also charged with murder. Police have said Papasotiriou was in Europe at the time of the killing. All of this came as a shock to Karin Horvath, a Toronto real estate agent who was the first to list the Ossington Ave. residence for sale in November 2011, eight months after the murder and a full year before her client, Papasotiriou, was charged. Papasotiriou was still living in Europe when he and his aunt and uncle decided to list the property with Horvath. Before taking it on, Horvath did a Google search of the address to see if anything unusual came up. The murder was one of the first results. Horvath said Papasotiriou told her the victim was a tenant about whom he knew little. She said she had no idea he was actually married to Lanteigne. In Ontario, realtors are required under the Real Estate and Business Brokers Act to disclose any “material fact” that could affect the value of a property, including a murder, suicide or suspicious death. When Horvath told Papasotiriou back in November 2011 that she would have to reveal the home’s history to any potential buyers, she says he challenged her. “He did not want to disclose the information because he didn’t want to bring the home value down,” the agent said in an interview. Papasotiriou sent emails to the Toronto Real Estate Board, asking for clarification. In the end, he agreed to disclose. “I wouldn’t have taken the listing otherwise,” the agent said. Sanctions for agents who don’t disclose material facts can range from warnings to major fines, suspensions or licence revocation. And then, as recent cases have shown, there is also the possibility of a civil suit. In Bowmanville last year, a couple sued a broker and the people from whom they had purchased a home after they found out it had been the scene of a horrific double murder 15 years earlier. If the claim proceeds to trial, it could become a buyer-beware test case that would bring much-needed clarity to what is now a legal grey area. Though many U.S. states and the province of Quebec have laws that govern how and when a murder must be disclosed to a potential homebuyer, in Ontario there is only the very vague realtor’s code of conduct. Many U.S. states require disclosure if a death has occurred within a finite period of three years. The Ontario realtor’s code sets no statute of limitations, which technically means that if an agent knows about a murder that happened in a house a hundred years ago, they have to disclose. Lebow, who often testifies in court as an expert witness and has taught classes on property stigma, thinks this is ridiculous. He also believes it unfair that the onus to disclose rests on the agent instead of the property owner. What is an agent supposed to do if a client doesn’t fess up about a home’s history? “A real estate agent shouldn’t have to play real estate detective,” he says. One day last week, a middle-aged woman wearing a long fur coat parked a luxury car with a Manitoba plate at the curb outside 934 Ossington Ave. and went inside to retrieve a few small cardboard boxes. When approached, the woman declined to discuss the sale of the property or confirm whether she is one of the owners. By the end of this week, 934 Ossington Ave. was still on the market. Jackie Carron had better luck recently with a brick bungalow in Scarborough. The Toronto agent listed the Marsh Rd. property late last year for $379,900 with a note in the “broker’s remarks” section asking agents to phone her before registering offers. When they did, Carron disclosed the uncomfortable facts: Anna Karissa Grandine drowned in the bathtub of the home in October 2011. The 30-year-old was five months pregnant at the time. Her pastor husband, Philip Grandine, was later charged with first-degree murder and is awaiting trial. Agents for five potential buyers phoned Carron to discuss the possibility of registering an offer and then backed out. Still, after only a month or so on the market, the house sold for $370,500 — fairly close to asking price. Several agents consulted for this article said the real problem with the Ossington house is that it’s overpriced and, if it didn’t sell for $950,000 last year, it’s not likely to fetch that now. Toronto real estate agent Tony Domingues, who listed the property for sale on Feb. 2, believes it is worth what the sellers are asking and says they’ve had a lot of showings in the past couple of weeks. At this point, he said, disclosure isn’t even really an issue because most agents are familiar with the property’s history by now. The agent said he’s confident the house will draw a buyer, particularly since spring market momentum appears to be building already.